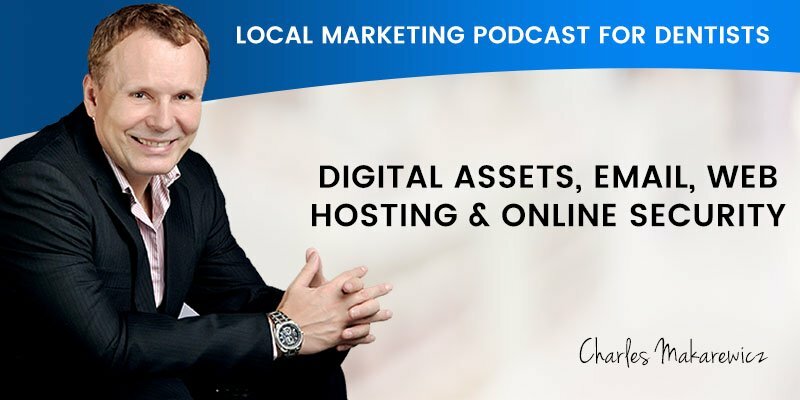 Scott Edwards and Charles Makarewicz discuss dental practice digital assets list as well as online security, email and web hosting. Scott: I’m Scott Edwards, and today I have Charles with me to discuss your digital assets, as well as your online security, E-mail, and web hosting. Charles will recap the important digital assets and why and how these must be protected and secured. Charles: Well it’s definitely something we need to know about and every dentist need to be creating that list. So when we get the new clients, we find that majority of dentists simply don’t know where the things are and they say “Oh my web hosting, I don’t know, I have to look for it, I can’t find it “and that’s pretty much with everything. Task #1, create a list. Something like Google Spreadsheet is a good way of doing that or even if it’s just in your E-mail where you can quickly search for it and find it. It need to be in that central place where you can easily locate it. So number 1 is your website. So anything to do with the website should be there. Task #2, your logins. So your Facebook log-ins. All this other social media channels log-ins, including YouTube and knowing what social media channels you have is important. So things like the link to the actual profile as well as the E-mail address and the password. So those are the three things you will need for the social profiles. Additionally, your log in to Yellow Pages, Yelp, Truelocal and all other citation directories. They should be in one place and stored there with easy access. Additionally, even logins to things like your emails; keep that in one place, knowing how many email accounts you have for your main domain, do you use any other Gmail accounts for something else. You should have access to that email address and that should be recorded as well. Scott: What about your website, Charles? How should dentists be maintaining and securing their websites? Charles: Number 1, again in your digital asset list, you should have a certain section for the website, and number one is having your domain register logins, so knowing who they are, so let’s give some example, could be Crazydomains, it could be GoDaddy, or, there’s a lot of others. You should have the log in to it. Now, let’s just review some of the problems you could be having here. Some digital agency will not give you log in to your domain register. Sometimes you will not even own it! It will be under their name and that’s your really important assets. That’s like having a house and you don’t know where your land title is. You really need that title, you need the logins, and knowing your domain is registered under your name. You normally will pay renewal, so if you’re not sure who they are when the renewal come in, and you receive an email, then you will know, this is the company and you can reset the logins. So the worst case scenario, if you can’t find log ins, just call them. Crazydomains, for example, you can just pick up the phone, go on the website, get the phone number and call them directly. They’ll ask you some security questions, then you can retrieve your logins. Now in case something is not right there and you can’t find anything, you contact the digital marketing agency you work with – perhaps you’re no longer with them – and you ask for the log in to the main register. Percentage of those companies will tell you, “Oh sorry, we can’t give you any logins because we created that account under a wholesale account.” Well that is a problem for you because now you can’t log in and you don’t really own it in away. You could be still owning, could be under your name but you simply don’t have access to it, so that’s not good. Basically, you need to ask them to transfer it to your own name. I will recommend Crazydomains because it’s really easy to do and use. Just open an account with Crazydomains and click ‘transfer domain’. You can go to that section and then you will need a code – transfer code. You only need that transfer code to transfer to your own name. It’s not very difficult and you should do that as a first step. Scott: Charles, I’m a little confused by what you just said; when you say transfer domain name back to your account, how does that work? Charles: Let’s just recap it. Twenty to thirty precent of our new clients will have a wholesale account for the domain register. They will employ the digital marketing agency who build the website and set everything up, including domain. That company or that digital marketing agency or web designer company will use their own wholesale account, which will have thousands of accounts. That means that you will never have a login. You won’t be able to do anything without them. That means you don’t have full control of your number one digital asset. Now how do you obtain the full control? Firstly, ask that agency if the domain is under your name. In most cases, they would setup the domain under your name. That is good. That means that’s very little work for you because after that’s confirmed, you simply say “I don’t want the wholesale account anymore. Can I please have this transferred to my own personal account, which I can login to?” They will say yes. Okay great! So then you just say “Can you please send me the transfer code?” So they will send you the code. You can use that code. Go to Crazydomains, click ‘transfer domain’, enter that code, and you’re own the domain. It’s under your own account in Crazydomains, you can login. Now you have a log in to Crazydomains, and why you need that is just in case you wanna change the hosting, you can do it yourself, or you can give to the new provider your login. When the new provider comes in, and they don’t have any logins, that is not really a good situation to be in. Is that answer your question, Scott? Charles: Excellent! So the step 1 in regards of the domain registration is very, very important. That’s why I like to recap it and it’s good you asked me that question because twenty to thirty precent of our clients coming on-board have this issue. They don’t know it and they need to own it. They don’t know they should have the logins. It’s just not obvious to them. This is critical. This is your digital asset. It’s even more important then having your website built is to own your domain, to own that domain you registered. It’s your branding, it’s your digital asset and that’s number 1 on the list. Number 2 is your hosting. So you need to have a log in to your hosting. Having things like CPANEL log in and addition FTP logins perhaps. Having CPANEL login gives you access to everything so that is the critical one. CPANEL control your hosting. One is web hosting, the other one’s email hosting. You need to understand what emails you have. You have to make a list of all your email addresses and passwords, and perhaps configuration. You could have a configuration screenshot, which comes handy if you’re setting up a new computer. It would be easier for you to access that. It should be in your digital asset list. Additionally, you might have email outside of your main domain email and it could be a Gmail. You should record it. You use it, let’s say, to create a Yellowpage directory entry or a profile in Truelocal and you use Gmail, Hotmail or something like that. You should have the record of that. Scott: Charles, you just touched on email. Why do you recommend Google or G Suite for our dentists? Charles: Oh I didn’t actually say that! But obviously, you know me well and you know that’s what I recommend to all the clients. That’s a very good question. A lot of new clients comes in and first, you don’t have any digital asset records. They can’t track all their logins. That’s a big mess. They don’t know what email they use and on the top of it, the email doesn’t work everyday. One day it’s down, one day it’s up. They basically lose business because of the email. My recommendation is to use Cloud Platform instead of your normal server or web hosting platform. So why the G Suite? Google has the best systems in the world in regards of Cloud and has the best spam filtering. So if you want a reliable email which always works and you can easy access from a desktop, from a web browser without going to your email client. Now, most of dentists they will be using Outlook – so yes, you can set up G Suite in your Outlook. I had a question from a new client just come on-board. They said “I don’t really want just access from a browser. Can I access it from Outlook as well?” Yes, it’s not complicated. You simply set up another email in your Outlook that accesses your G Suite email. It’s not complicated. There’s just 3 step process and it can easy be easily done. Scott: Charles, how important is the topic of security for our dentists? Charles: It’s critical, especially in online business. Everything is open to the whole world and there’s a lot of hackers then. You can lose your identity and that just becomes really a hassle, and you want to avoid the hassle. So how do we proceed from there? Firstly, do not use the same password everywhere. Try to use complex passwords. Have the one password you remember. Then use the software like Lastpass. You can go to the website, Lastpass website. It’s the software we use here a lot and it’s important to have a common platform where you can store all your passwords. I recommend Lastpass, that’s all we use internally for our digital agency. That’s all for the passwords. Other part of the security is to secure your website. Nowadays you get penalised if your website is not SSL, get your developer, make sure that’s implemented, that you have a little green light indicator in your browser at the top which says https. That’s called SSL certificate and make sure it’s installed on your website. And now let’s talk about website security. If you use WordPress – most of the sites were built WordPress based – that’s the most popular platform. It’s the same with Windows. Because it’s most popular, it’s vulnerable. The hackers look at it. For that specific reason, we want to make sure that you protected. You need to talk to your developer and make sure that all your plugins are updated and your WordPress theme is regularly updated because that causes security issues, and obviously your passwords. Install something like Limit Login, so limit log in to 3 logins which is similar to the system used by banks. Scott: Charles, once again you’ve provided some great information and given lots of great ideas about how dentists can protect and secure their online assets, including their website and email systems. Well that wraps up today’s podcast, folks! Stay tuned for our next episode when we discuss the 3 costly blind spots most dentists miss, to keep them from attracting more ideal local dental patients.